Kids everywhere are anxiously awaiting for the Easter Bunny to hop into their homes and fill their baskets with delicious treats and toys. 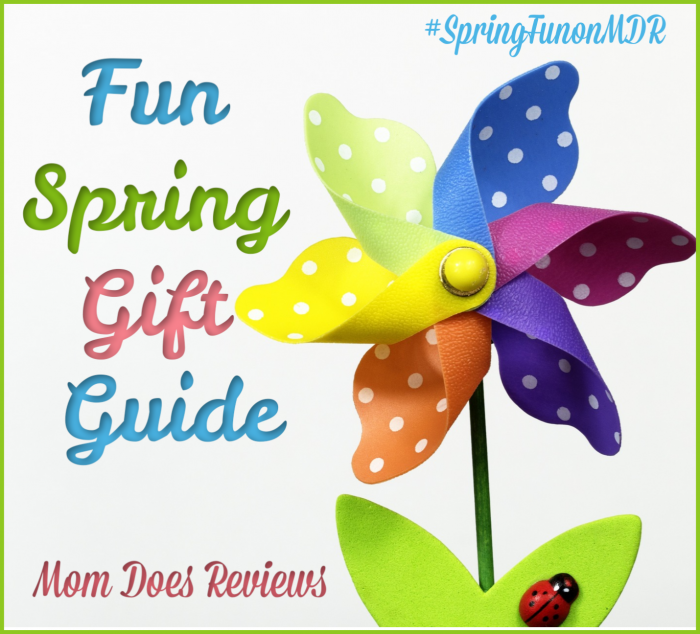 Here are some of our top picks straight from the Easter Bunny himself that kids will love to entertain and explore with this Spring and Easter season. 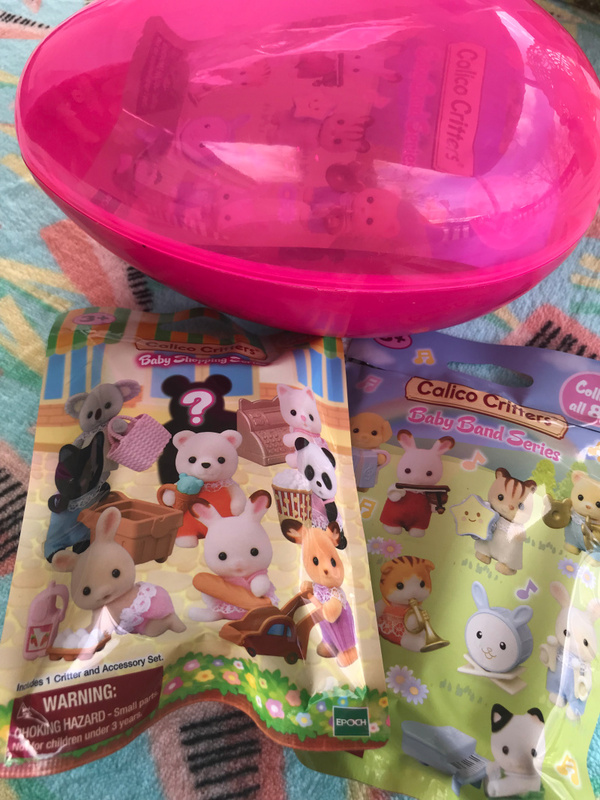 Blind Bags are all the craze right now with kids and Calico Critters have joined in the fun. They give an exciting element of surprise as they eagerly open them up to see what new critter they will add to their growing collection. Each Baby Band Series bag includes a Baby critter and a uniquely designed musical instrument. The collection includes eight new collectible babies to complete the band: Shiloh Yellow Labrador on xylophone, Daisy Maple Cat playing the Trumpet, Jason Cuddle Bear with cymbals, Henry Sweetpea Rabbit on the drums, Milo Toy Poodle with accordion, Grace Hopscotch Rabbit playing the violin, Joseph Tuxedo Cat on the piano, and last but not least, Luke Hazelnut Chipmunk playing the tambourine. Calico Critters also has a new Blind Bag series – Baby Shopping Series. Baby Shopping Series blind bags contain a baby figure and a shopping accessory, which are fun to both collect and play with. What will you find inside? There are nine characters, including a secret one. Baby Shopping Series contains a shopping-themed accessory, and a baby figure. Take it on cute shopping adventures! You can combine with shop sets (sold separately) for even more fun with shop play. Or place inside a home (sold separately) for the babies to enjoy a game of pretend shopping. Each Blind Bag retails for just $4.95 each and will be provide hours of fun and creative play as your little ones build and cultivate their own family of Calico Critters. 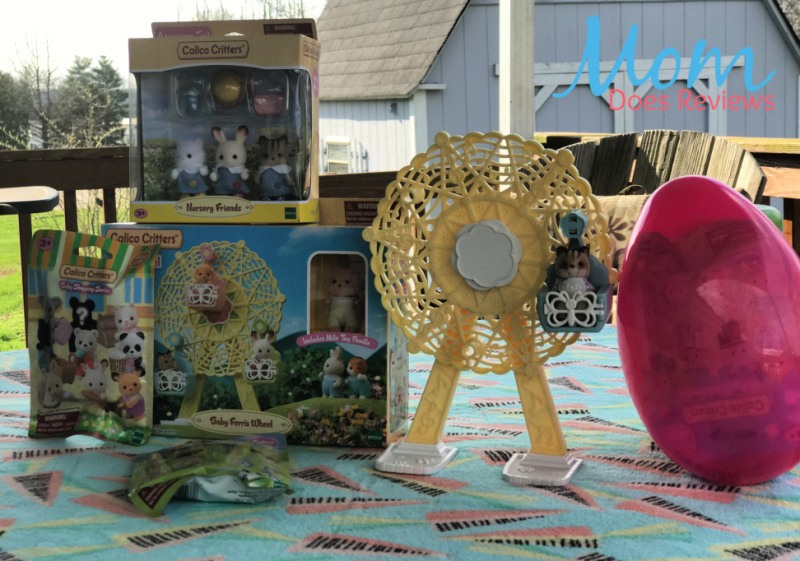 Other fun items from Calico Critters that are perfect for Easter include the Baby Ferris Wheel and Nursery Friends Set. 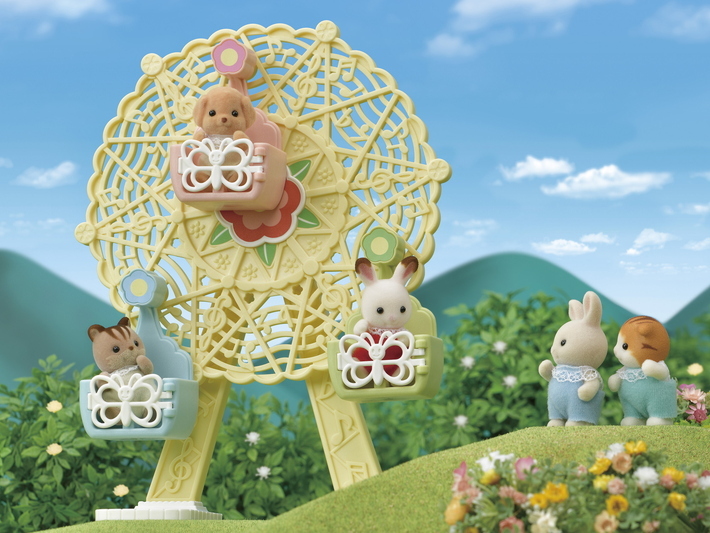 With the Baby Ferris Wheel, kids can take the Baby Critters for some outdoor fun at the amusement park on this sweet little Ferris Wheel. They can open the gondola doors and have the Baby Critters hop on the carts for a ride on the spinning wheel. The Ferris Wheel includes three gondola doors and Toy Poodle baby Milo who is ready to play! The Ferris Wheel set retails for just $17.95 and is recommended for ages 3+. One of our favorite sets is the Baby Nursery Set. It gives kids the opportunity to practice a being a parent and taking care of their own little ones. The Nursery Friends Set allows kids to get a few of their favorite Baby Critters ready for nursery school. 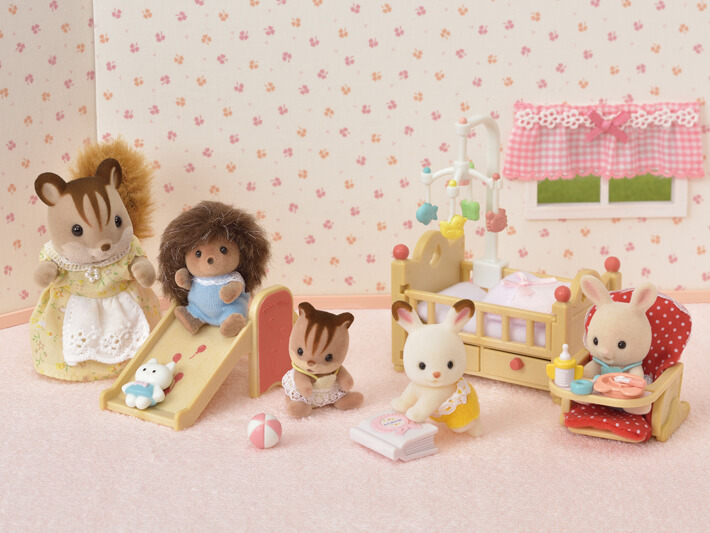 The Nursery Friends set includes three Baby Critters with their school uniforms, along with some accessories for the day: Grace Hopscotch Rabbit wearing a cute red hat, Luke Hazelnut Chipmunk with a water bottle and Bonnie Persian Cat with her pink backpack. Nursery Friends Sets retail for just $12.95 each and are recommended for kids ages 3+. I remember growing up and loving those little shrinking toys you could put into the oven and create cool keychains, suncatchers and more. Nowadays, kids have so many more fun, safe options and that includes the fun craft – Aquabeads. Aquabeads arts and crafts products are new and improved as they allow for a quicker drying time to create even more incredible designs. The new sets feature an innovative Flip Tray and Bead Receiver to set art work aside for faster drying while continuing to create additional masterpieces. This year’s collection also includes new metallic gold and silver gem sets and connectable studios. Kids make Aquabeads creations from included templates or their own imaginations. They place beads onto the layout tray, then spray with water to fuse the beads together. Once dried, the creations can be shared with friends and family. Willow goes crazy over Aquabeads since I introduced them to her last Christmas. She is going to be so excluded to try out this new box of Safari fun and will make great entertainment for her this summer. With the Box of Fun-Safari , kids can create fun jungle designs quicker using the 2 flop trays, stands and play mats. 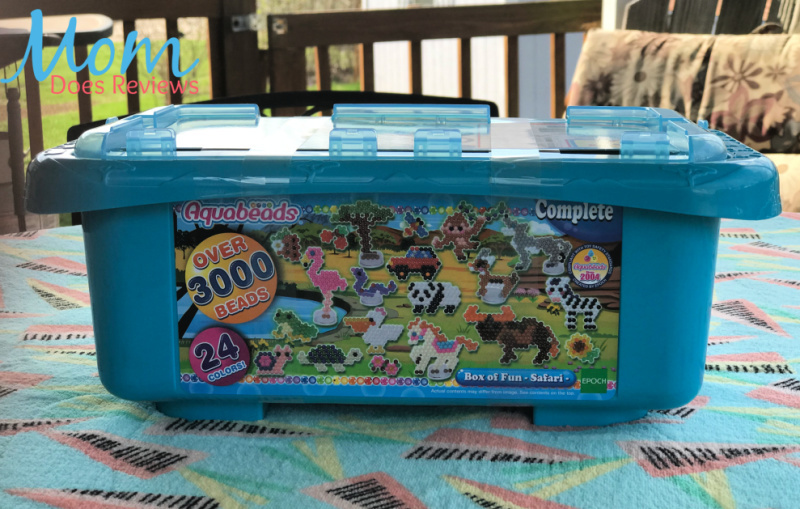 The container fits all contents, which includes more than 3000 jewels and solid beads in 24 colors, a bead palette, 2 flip trays, 2 receivers, 10 bead stands, sprayer, template sheets and instructions. Bead pen sold separately. It retails for just $29.95 and recommended for kids age 4+. Let’s talk about the latest game that is perfect for land and water lovers alike – Gulpin’ Guppies. 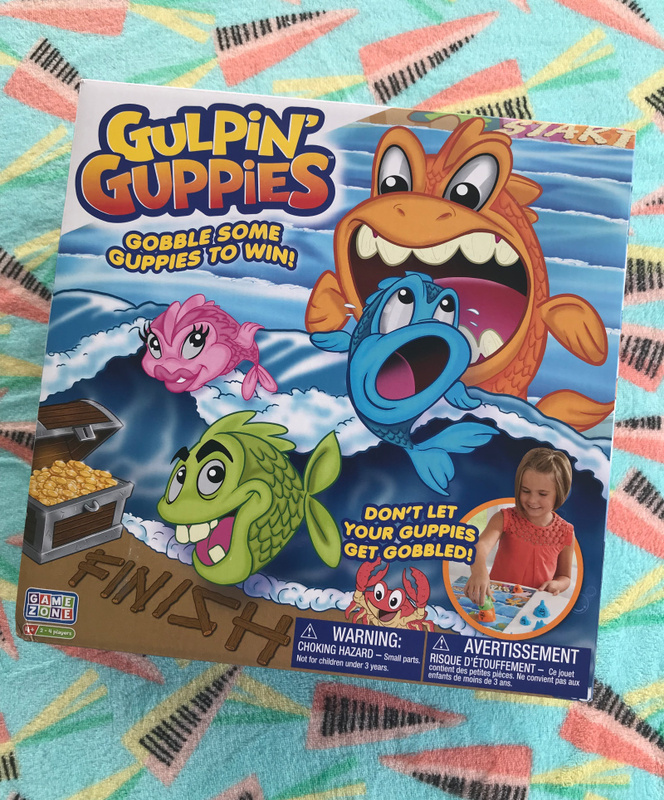 This game allow kids to ride the wave, sink or swim, to gobble some guppies for a chance to win! No reading required – each player has the opportunity to spin the wheel and gulp each other’s guppies to make their fish grow as they swim to the finish line. Uh-Oh! Be sure to stay clear of the waves or the fish will get wiped out and lose any guppies they gulped. 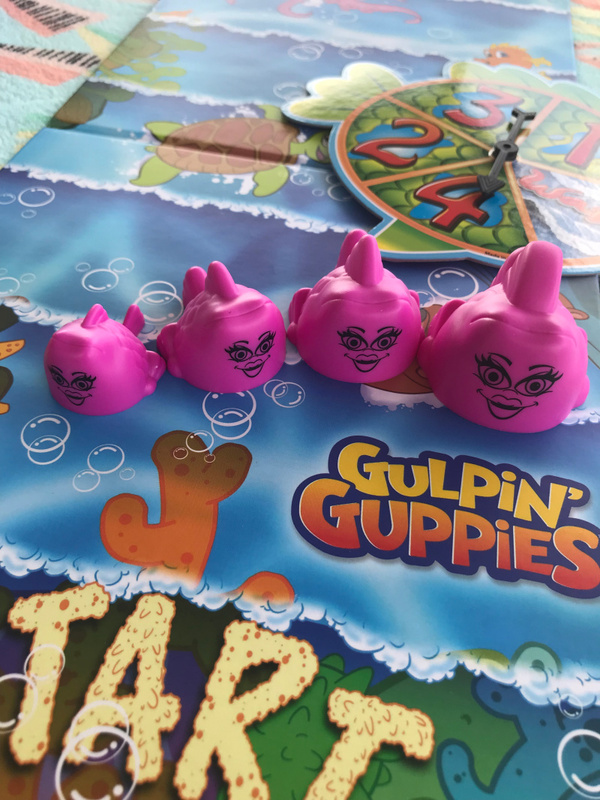 Gulpin’ Guppies helps in promoting counting skills and has two versions of how to play to accommodate kids of most ages. The game retails for just $14.95 and is the perfect rainy day activity when you are trapped indoors. Recommended for kids ages 4+. With so many fun options available, you will enjoy playing with you little ones on Easter morning as they delight in their new toys and new sweets that the Easter Bunny brought them.